This trek is an excellent alternative (one of the best in our opinion) for those who want to get off the ‘beaten track’ and have an insight into authentic encounters with Quechua communities and spectacular scenery give these treks a wonderful blend of tradition and splendor. Passing through the rich pastoral regions of the Cordillera Urubamba, we traverse high mountain peaks and sub-tropical valleys, stopping along the way to enjoy scenic lagoons, natural hot springs, and Inca remains. The remoteness of the area has allowed its people to preserve traditions of llama and alpaca herding, potato cultivation, and colorful weaving dating back to the Incas. Minimum Altitude: 3800m / 12,467ft. Highest Altitude: 4300m / 14,107ft. Today we pick you up at 5:00 am and travel by bus for the 1 hour ride to the village of Pumahuanca (2840m/9400feet) located in the Sacred Valley between Pisac and Urubamba. Huaran is the start of the trail. We´ll meet up with the horsemen and pack the horses. Leaving the Sacred Valley behind us we head northwards following a gently climbing trail that runs parallel to the small Cancha Cancha River. It´s a 4 hour trek to our destination, the small village also named Cancha Cancha (3800m/12600feet) where we´ll spend the night. After breakfast We´ll Leave Cancha Cancha to continue north east up the valley, passing small village stone houses. After hour the path flattens out before climbing steeply for the 2 hour trek to the highest pass, called Pachacutec Pass (4200m/13900feet). From the pass you´ll be rewarded with superb views of Pachacutec Lake and the snowy peaks of Pitusiray. The path continues for an hour along a narrow ridge until dropping down into a beautiful valley filled with glacial lakes . Descends into the next valley, following a series of cascading waterfalls to the village of Quishuarani (3700m/12250feet) overnight. The trail follows now the river valley downhill for about 3 1/2 hours to the town of Lares (3100m/10250feet). 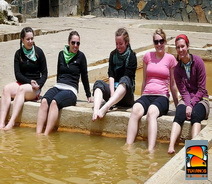 Hour before arriving in Lares town you´ll have time to enjoy a soak in some open air thermal springs (bring a swimsuit). 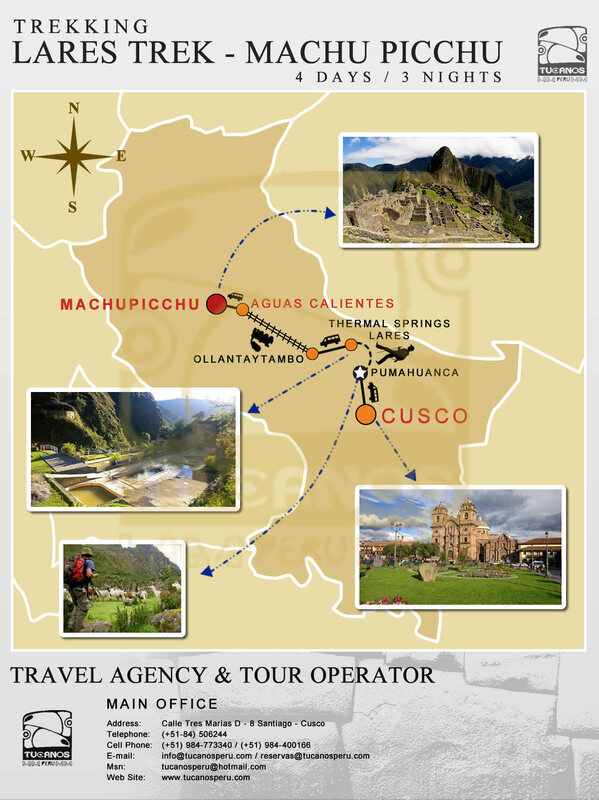 At about 1pm (after lunch) the bus will pick us up and leave to Ollantaytambo, there you will have some time to rest and see this amazing town before going to Aguas Calientes by Train . We´ll have early breakfast. Then at 5:30 am we will catch the first bus to Machu Picchu in order to appreciate the magnificent city as the sun is rising. A walking tour (approximately 2 hours) is given by your Guide and after this you can explore the mysterious city by yourselves. 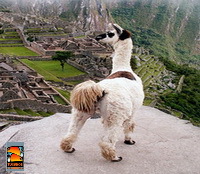 If you still have energy you can also climb HuaynaPicchu (2720m/8990feet) it takes 45 minutes to reach the top. What is Includes? What is not Include? Bus up to Machu Picchu.